Three years ago, Let's Knit started 'Yarn Shop Day' to support and promote yarn shops around the UK. These days we can buy yarn from the comfort of our own living rooms, so why do we want to make the effort to visit our local yarn shop? Your local yarn shop may not be that local. I consider Spin A Yarn my local yarn shop. But it's an hour's drive away. For the first yarn shop day and for last year's yarn shop day I spent the day at Spin A Yarn in Devon. You can read about last year's event here. This year I'm not attending a yarn shop event because it clashes with Simon's birthday weekend and Vanessa will be home. Also, I've got such a fully booked schedule this year that I just can't take on any more events. 30th April is Yarn Shop Day and I encourage you to find out where your local yarn shop is and if they're doing anything special that day. If they are, then get involved. If they're not, why not go along to support them anyway. Most yarn shops have dedicated staff that love knitting and/or crochet. You can see and touch the yarns on display. You can see the colours in real life. Shopping in a shop is not the same as shopping online. The staff can advise you and help you choose the perfect project for you and the yarn to go with it. If you get stuck, they may be able to help you out. One of my workshops a Sitting Knitting in Birmingham. I'll be back there in June to teach Toe Up Socks. 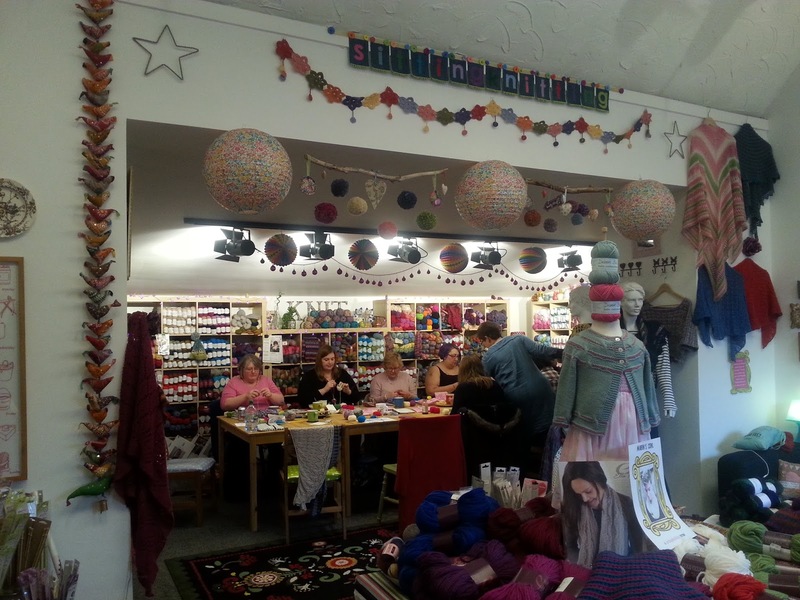 Many yarn shops also have knitting groups and workshops. Workshops give you the opportunity to improve your skills, learn something new and meet other knitters. Spending a whole day knitting and talking to people who love knitting as much as you do is fantastic. Most of us don't get to spend all day immersed in our craft so treating yourself to a workshop is wonderful. See my workshop schedule. I've just been to my local knitting group this morning. I enjoy going most weeks to chat to sit down for an hour or two and knit and chat. Sometimes we may chat more than we knit. But the ladies at my local knitting group love knitting as much as I do. When we finish projects we bring them in to show off and everyone knows and appreciate the amount of effort that has gone into making it. If any of our members get stuck on their project, there's usually someone to help them out. And we have some interesting discussions and they don't all involve knitting. So this month, find out where your local yarn shop is and what they offer. Join their knitting group - many run knitting groups both during the day and in the evening. Pop in on 30th April and make a purchase, even if it's just a small one. If we don't support our yarn shops they will disappear from our high street. Check out Let's Knit for events in your area for Yarn Shop Day! Are you doing anything special for Yarn Shop Day? Tell me in the comments below.